The home tradition of an Advent wreath has, for better or for worse, invaded our churches. Sit in that purple chair and render judgment as a new liturgical year commences. 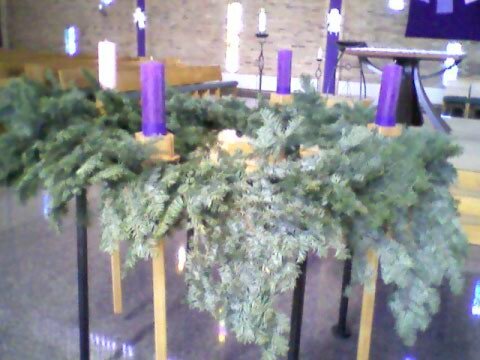 How would you handle the Advent wreath in a church? Does it not belong at all: would you be a holdout for keeping it in the home? If you used it, how would you execute the plan? A small house-sized wreath in some corner of the sanctuary? Put it in the narthex, suspend over the assembly heads, devote a devotional space to it? What about something big? I knew a parish that used an eight-foot wagon wheel. While that was a good proportion for their large church, it was a pretty hefty display. At one of my parishes, they covered an eight-foot plywood ring with chicken wire, then stripped down two trees to flesh it out. It was mounted on the wall near the baptismal font. A liturgist colleague told me of her parish where the Advent wreath was positioned inside the front entrance. People walked through it on the way on and out–it night have been twelve feet in diameter. We have a large (10 ft diameter, perhaps?) hanging wreath of Damocles over the principal intersection in the body of the nave (a vault of between 60-70 feet in height, mind you). Hanging is more appropriate than setting, as it were, but it is a royal pain to light. The lighting is not a liturgical act – it’s lit before Mass, which strikes me as best practice. I’ve rarely seen a well-executed Advent Wreath in a church. Often they are either way to large or way too small for the space. A fake garland wrapped steel frame just seems inappropriate in a liturgical setting. I’ve always thought that it would be great to have some local artisans create a contemporary Advent Wreath. It wouldn’t have to be a ‘wreath’ per se, but a contemporary interpretation of that idea which would be appropriate for the given architectural and artistic setting. Bit of a tangent, but just some thoughts! Can someone tell me how you practice with the Advent Wreath! !